The District of Columbia Department of Transportation has published its list of most dangerous intersections in Washington D.C. Using statistics for the three-year period 2012 through 2015, DDOT identified the traffic intersections with the most serious crashes and injuries. The survey included motor vehicle, bike, scooter, motorcycle, truck and pedestrian injuries, if they showed up on MPD or DC Fire Department reports. Topping the list were the intersections of Wisconsin and M Street in Georgetown, and 14th & U Street, right outside of the District’s Reeves Center Municipal Center. The intersection of 14th and U Street saw 208 total accidents from 2012 to 2015, two of which were fatal, and 49 others resulted in serious personal injuries. Ten of the collisions involved pedestrians, fifteen cyclists, and seven involved motorcyclists. Not unexpectedly, for the U Street Corridor, the most dangerous time was Saturday night. 56% of the collisions happened at night, with 24% on a Saturday. The U Street corridor has seen some of the city’s most intense development. Unfortunately, traffic control systems have not developed as fast. According to DDOT, the most common cause of personal injury was driver inattention, followed by speed. Only 1.5% of serious accidents were related to alcohol or drugs. MPD runs periodic alcohol enforcement sobriety checkpoints at ingress and egress points to the zone. 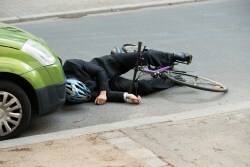 Pedestrian accidents are the most frustrating, and along with bicycle incidents, can be the most serious. Almost half of pedestrians struck were in marked cross-walks. Clearly, better engineering and street-scape choices need to be made to protect pedestrians in cross-walks. Other dangerous intersections were predominantly in Northeast: New York and Bladensburg Road, NE, First and Mass. Avenue, NE, and Minnesota and Benning Road, NE. Bottom line, be careful. Increased traffic and distracted drivers present a clear danger to be avoided.